Summer is just around the corner which means bikini season will soon be in. But as we all know, our bikini areas (specifically our singit) tend to be dark because of friction caused by tight clothes and shaving. So if you're feeling conscious about it, there's something you can do to even out the skin down there: Get it lasered. 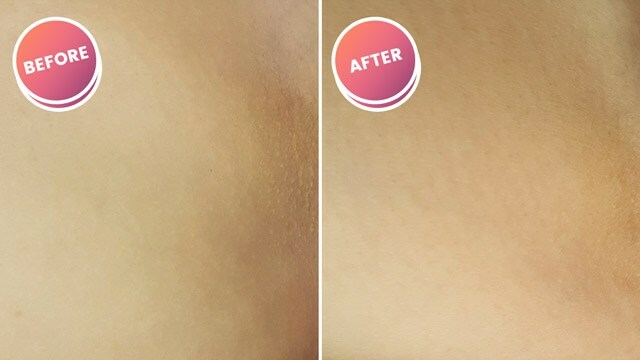 To see if it truly works, we asked one Cosmo Girl to try a session of Belo's Angel Whitening Laser! See the results below. Before the procedure, I had a consultation with Dr. Givenchy Ang who told me that my bikini area was already on the fair side. However, I still had discoloration in some areas due to wearing tight underwear—so this was the perfect treatment to even things out! The whole treatment was quick and non-invasive, lasting only for 10 to 15 minutes. The laser felt like subtle and hot needle pricks, but wasn't painful at all! In fact, I didn't have anesthesia the entire time and I was able to easily walk around right after. Immediately, I noticed that my bikini area was red, which is normal. For my aftercare routine, I was told to apply their laser cream morning and night for two to three days. Easy, right? But what I love most about the treatment is that my bikini area now looks so ~smooth~ and there was no irritation or post-treatment peeling! I 100 percent recommend this to anyone who wants to lighten their bikini area! Plus, according to Dr. Ang, the laser can also remove redness on your face and lighten your kilikili. Remember: When you go in for your session, wear a dress or skirt to avoid the awkwardness of pulling your pants down. Lol! *Name and occupation have been changed. For inquiries, visit www.belomed.com, call 819-BELO, or email at info@belomed.com.